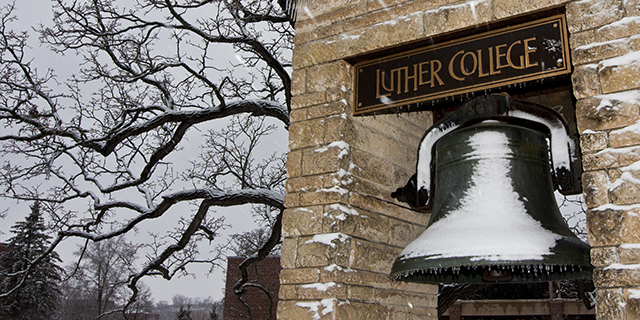 Christmas at Luther: Tidings of Comfort and Joy premiered December 2012. Christmas at Luther is a decades old institution at Luther College. The theater fills to capacity. The house lights dim. From seemingly everywhere comes the soothing sound of over 500 voices in perfect blend with a symphony orchestra as the students of Luther College envelop the audience for the start of Christmas at Luther: Tidings of Comfort and Joy. Christmas at Luther is a decades old institution at Luther College. Christmas celebrations were begun as Juletide and featured performances of Handel’s Messiah. Over the years, the celebration reached into the deep well of Upper Midwest choral traditions and allowed the school to highlight its musical prowess. Six choral ensembles, a full symphony orchestra, a handbell choir and the Rost Memorial Organ come together for the annual Christmas concert. Each ensemble is a distinct group of auditioned student musicians. Nordic Choir is the college’s premier choral ensemble. This seasoned group of mixed voices tours nationally and internationally. They’ve performed from coast to coast — from the Kennedy Center in Washington, D.C. to Walt Disney concert hall in Los Angeles. Internationally, they’ve presented concerts in Europe, Scandinavia, Mexico, Russia, and Eastern Europe. They wear sapphire blue robes during performances. Aurora is exclusively first-year women who wear elegant black gowns. In addition to performing the Christmas at Luther concerts they sing at worship services both on- and off-campus and present their own concert in the spring with Norsemen. Norsemen is the first-year men’s chorus. They perform in sharp black tuxedos. Like Aurora, they sing at worship services on- and off-campus. And they join together with Aurora to present a spring concert. Norsemen is said to be one of the largest first-year men’s college ensembles in the country. Cantorei is the college’s women’s choir open to all years. They wear maroon robes. In addition to performing at campus worship services they sing with the Northern Lights Women’s Chorus— a women’s community ensemble from Northeast Iowa. Cathedral Choir is a mixed choir drawn from the school’s sophomore class. This group is an active part of campus worship services and performs during an annual spring tour. They wear emerald green robes. Collegiate Chorale is the college’s mixed voice ensemble of select juniors and seniors. They perform sacred choral works of a variety of styles and periods. They sing monthly at Luther’s Chapel services and mount an annual tour. Their robes are a ruby red. Luther Ringers is the campus handbell choir. They perform annually at Christmas at Luther, along with campus worship services and a spring concert. Luther’s Symphony Orchestra is an integral part of Christmas at Luther concerts. The eighty-plus musicians not only provide instrumental accompaniment to the vocal ensembles, they perform their own standout pieces. The Symphony Orchestra tours extensively throughout the United States and maintains a three-week residency in Vienna, Austria every four years. Responsibility for Christmas at Luther concerts falls to Dr. Allen Hightower, the Director of Choral Activities at Luther College. Dr. Hightower has his Doctor of Musical Arts from the University of California, Los Angeles. Hightower honed his career as a choral director and conductor at the Houston Masterworks Chorus; Sam Houston State University in Huntsville, Texas; California State University at Long Beach; and as a conducting intern with the Los Angeles Master Chorale. This is his third Christmas at Luther concert for the college and his debut concert for public television audiences. was produced by Twin Cities Public Television and Luther College.